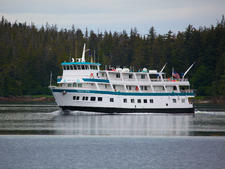 The exodus of Cruise West from the Alaska small-ship scene in 2010 left a void in the expedition market for newer lines to fill. One of these, Sitka-based Alaskan Dream Cruises, picked up Cruise West's former Spirit of Alaska and, after renovation, launched it in 2013 as 49-passenger Baranof Dream. Local insight into Alaska, strong cultural component. 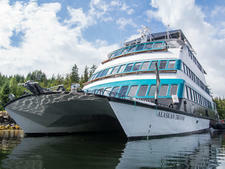 Alaskan Dream Cruises is owned by the Allen family, well-respected members of the southeast Alaska marine industry. Their cruises promise that passengers will explore the "real Alaska," with Inside Passage itineraries focused on the area's outdoor beauty and rich cultural heritage. Baranof Dream excels at its mission, with programming anchored by two expedition leaders, one who interprets native Tlingit customs and the other who concentrates on biology and wildlife. Baranof Dream is not a luxury vessel. There's only one public room that feels more like a living room than a lavish lounge, and alternative dining rooms are nowhere to be found (although the constant snacks ensure you'll be well fed). The smallest cabins are a mere 85 square feet. The atmosphere is decidedly casual; this is not the place for those looking for spa treatments, glitzy helicopter excursions or formal nights. Sweatshirts, hoodies and rain gear are the clothing of choice, and few people change for dinner. 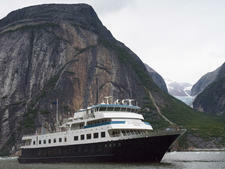 Plus, the ship's size allows it to get close to cascading waterfalls, playful sea otters and stray icebergs. Even native Alaskans say they see something different on every cruise. Overall, Baranof Dream makes the perfect vehicle for those who want to stray from the usual Inside Passage itineraries offered by larger cruise ships. You'll leave not only with plenty of wildlife photos, but a better understanding of how Alaskans live and play -- and an authenticity that comes from supporting local ownership. Baranof Dream's passengers are an active bunch, who profess that they want little to do with the larger cruise ships and typical Alaska itineraries. Most are in their late 50s to early 70s, with a few adult children accompanying their parents. Our cruise drew an international mix, consisting of six Italians, a couple from Australia and a couple from South Africa; the rest were American. Surprisingly, six people from Sitka were on our ship; they said that they had yet to experience Alaska by sea, and they wanted to do it with a local company. Dress onboard Baranof Dream is strictly casual. People tended to wear the same jeans, T-shirts and sweatshirts to dinner that they wore during the day. Forget heels, sports coats, skirts and dresses; most women didn't even wear lipstick. Speaking of gear, Alaskan Dream Cruises goes out of its way to make sure that you have the right clothes to be comfortable. Waterproof boots, jackets and rain pants are provided, although you're welcome to bring your own if you wish. Pack plenty of warm clothes for layering: wool socks, hats, hoodies and fleece are no-brainers. If you wait for the rain to stop in this corner of Alaska, you might never go outside, so dress to get wet. Gratuities for the crew are paid at the end of the trip, in cash or with your credit card as an addition to your total bill. The company pools tips, but you can also give individual amounts to waiters or housekeeping staff if you desire. The recommended amount is $15 per person, per day.